We find that ID fails on three different levels, any one of which is sufficient to preclude a determination that ID is science. They are: (1) ID violates the centuries-old ground rules of science by invoking and permitting supernatural causation; (2) the argument of irreducible complexity, central to ID, employs the same flawed and illogical contrived dualism that doomed creation science in the 1980’s; and (3) ID’s negative attacks on evolution have been refuted by the scientific community. As we will discuss in more detail below, it is additionally important to note that ID has failed to gain acceptance in the scientific community, it has not generated peer-reviewed publications, nor has it been the subject of testing and research. Expert testimony reveals that since the scientific revolution of the 16th and 17th centuries, science has been limited to the search for natural causes to explain natural phenomena. (9:19-22 (Haught); 5:25-29 (Pennock); 1:62 (Miller)). It seemed to me that the best response to Mr. Luskin (and various creationists calling me a liar in the comments on my blog) is to do exactly what they’re afraid I won’t: take an Intelligent Design research paper seriously and subject it to the same rigorous criticism that I use in any other paper that I review for journals. Let’s see if it holds up to scrutiny. I chose to read the most recently published (2012) research article (“A Tetrahedral Representation of the Genetic Code Emphasizing Aspects of Symmetry”). The author was a postdoc at Baylor College of Medicine (a legitimate research institution) at the time of the paper’s publication, although he doesn’t seem to be affiliated with them any longer. (Incidentally, this is a perfect opportunity for people to exercise their critical reading skills. I invite anyone who’s interested to look through my guide to reading scientific papers, and actually try it for yourself on this example paper before you go any further in this post. Then, compare your interpretation with mine, and let me know what you think in the comments below!). 1. Different kinds of proteins have different shapes. 2. Each protein is made up of chains of different chemicals, called amino acids. There are 20 amino acids, and they can be strung together in any combination the cell dictates. 3. The order of amino acids present in the protein determines its structure. Each amino acid has a different structure and chemical properties, so different combinations of amino acids lead to different types of proteins. Simple, right? Now, how does the cell specify the order of amino acids? 4. The order of amino acids is determined by a coded message. This code is carried by a strand of RNA, called messenger RNA (mRNA). mRNA signals to the cellular machinery which amino acids should be placed in a particular order, forming a long chain. And here is the best source you could possibly read on the subject (an excerpt from Stryer’s Biochemistry), though it’s very technical. (hint: start on page 17). So now that you know the general process of how proteins are made, let’s focus in on one small step: How does mRNA code for amino acids? It turns out that every three bases code for one amino acid, and every combination has been worked out. So we know that ACU calls for the amino acid threonine (thr), and GGA calls for glycine (gly), for example. We even have a table that shows it. Using the table, can you figure out the amino acid chain from my example above? There’s something special about the first and last triplets in my example above. They’re actually important signals (“start”/Met and “stop”) to the protein-making machinery (called “ribosomes”) that define the beginning and end of the amino acid chain. Now if you’re paying attention, you’ll notice that there are only 20 amino acids, but actually 64 possible three-base combinations (we call those “codons”). So there are some amino acids that are specified for by multiple codons. Take another look at the table to see what I mean. There’s a special biological term for that: degeneracy. Degeneracy doesn’t mean the same thing as it does in our day-to-day usage. Instead, it simply means that some amino acids are coded for by more than one codon (synonyms). Interestingly, it tends to be only the last base that varies between synonyms. (There are important biochemical reasons for this that I won’t get into, but you can find more about it in the Stryer chapter I linked to above). Got all of that? Okay, let’s move on to the paper! BIG QUESTION: Remember, this is not the question the paper is trying to solve, but the question that the field is trying to solve. In this case, my identification of the BIG QUESTION would therefore be: What is the scientific evidence for an Intelligent Designer? Next, I looked at the background provided by the author. While I’ve already summarized most of it above, I want to call your attention to something that I would criticize any author of any paper I was reviewing: there are no citations to any previously published work for the statements that he makes in his introduction. The only citations he presents are those to other proposed amino acid tables. It may seem like a silly thing, but it’s actually very important. All work that’s not original to a paper must be cited. Failure to do so is a red flag on many levels; the author, the reviewer, and the journal editor all should have caught this. The author goes on to discuss amino acid tables, such as the one I posted above and notes that they’re “convenient representations of the raw facts of correspondence, but they also point to the underlying order of the code.” (emphasis mine). As I read this sentence, I immediately stopped and asked: What does the author mean by “underlying order”? Order in this context implies intentionality and design beyond “raw facts of correspondence” (these codons specify those amino acids). Has this been demonstrated experimentally in some way? If so, who did the work, and how did they do it? It’s an important premise that the author builds the foundation of the paper upon, but it isn’t justified by any citation to previous work. He just throws it out there, using as his only example the fact that codons with uracil in the middle position encode hydrophobic amino acids. If the author is using this as evidence of “underlying order”, he needs to clearly explain how this demonstrates it. It’s true that the sixteen codons with uracil in the middle position encode hydrophobic amino acids, but if this is due to some kind of “underlying order”, why aren’t the equally hydrophobic amino acids tryptophan or cysteine also encoded by a middle-position uracil? Without giving any additional explanation or citation to experimental work, it appears that he’s hunting spurious patterns with no biochemical justification. 1. The uracil-hydrophobic pattern (again…what pattern???) shows that there’s an “organizing principle” to the amino acid code. 2. If there are other principles, maybe rearranging the genetic code in some specific way will help researchers find them. 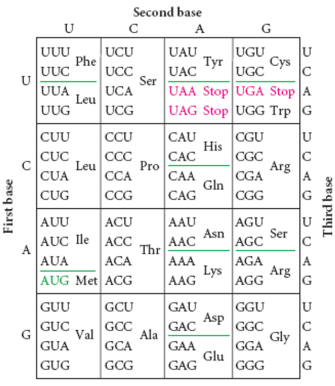 What are organizing principles of codon usage? I’d be interested in seeing some kind of analysis that might establish why uracils in the center position encode some hydrophobic amino acids, but not others, for example. The author doesn’t cite any papers on this subject, so I would expect that he might propose some hypotheses for this and then do the experiments to test them. EDITED TO ADD: We actually do have some evolutionary explanations for why the amino acid code is the way it is. See for example the chapter from Stryer that I linked to above, or this reference, or this one. (H/T to rbeagrie and Matt Hodgkinson for sending me links to those in the comments). But neither these, nor any other papers on that subject, were cited. (This research) will try to find a different, 3 dimensional geometric representation of the code that might better display its organization with an emphasis on function of amino acids. The author just wants to reorganize the standard coding chart? How does that answer the specific question? We already know which codons make which amino acids, and their chemical properties. Does reorganizing the standard chart actually provide us with any new information about the “organizational principles” of codon usage? The author explained his choices for how to construct the tetrahedral representation: repeated rows of equilateral triangles, with each cell of triangle representing a codon. Start and stop codons were placed at the vertices of the triangle. He chose to fill in the remaining cells with amino acids according to the following principles: 1) place the hydrophobic amino acids in the central cell (presumably because that’s where hydrophobic amino acids go in proteins), 2) place the others in cells according to principles of “balance and symmetry” (a rather subjective approach) and/or function. So, to summarize the methods, the author simply rearranged the table of which mRNA codons specify which amino acids, grouping amino acids by function. There’s not much to it, other than to utilize “principles of balance and symmetry” to create an aesthetically pleasing pattern. In my judgment, this is not a rigorous paper, and would almost certainly not be published by one of the more widely read biological journals. The only citations in the background material are to previous representations of the genetic code. There’s a fundamental assumption (that the codon code reveals principles of “underlying order”) built in to the paper, which is presented as a simple assertion, with no reference to any research justifying it. The methods are highly subjective. On final analysis, this paper isn’t really anything more than a rearrangement of existing information, trying (and failing) to find meaningful patterns in it. No new scientific knowledge has been the result. No further hypotheses were proposed. No discussion was provided of what future work might be done. The author himself even points this out. So, Mr. Luskin, rather than “tossing it in the trash” unread, I have given serious consideration to the most recent research paper that I can find from a journal affiliated with the ID community. I’m not impressed. I stand by my position that the Discovery Institute wouldn’t be a good choice when seeking expertise in evolutionary biology. My cautions with regard to Discovery Institute and ID papers isn’t because I can’t stand anyone who disagrees with me. Rather, the Discovery Institute and its affiliated authors have again and again shown themselves incapable of producing any meaningful, rigorous, and original research that challenges evolution. The responsibility to establish scientific credibility rests with your side. Many thanks to Rudy Raff and Steve Scott for comments on drafts of this. How many papers on evolution are published on average per year in PNAS? In Science? In Nature? My guess is several. Now, how many papers are published in these same journals on intelligent design? My guess is none. They will (of course) say that the editors of these publications are uniformly biased against “non-materialistic” (or whatever their currently preferred synonym for “God” is these days) explanations of natural phenomenon, and therefore won’t allow their papers through. But it’s obviously a smokescreen. The papers, at least if this is representative, are terrible science. So if evolution is wrong, are ID advocates going to say that evolutionary biologists are conspiring to undermine the moral fabric of society? Ha ha. He had also introduced me to the http://www.talkorigins.org/ and http://www.notjustatheory.com websites, since both old earth creationism and young earth creationism essentially make the same claims, with the same faults. Further, many scientists do infact review literature (creationists’ tend to proselytize these). e.g. Riichard Dawkins’ in his book God Delusion, reviewed the Watchtower’s ((Jehovah’s Witness)) 2010 creationists’ brochure. Most of the arguments could be summed up as an argument from incredulity, while mis-defining evolution, and misquoting scientists. Now if only you were able to respond directly to the discovery institute. Afterall there supporters are more than welcome to respond respectfully on your page. Yet for some reason we can’t seem to respond on there page. Any of them. Considering that There senior fellows seem to spend more time writing blog posts than any other organization I’ve seen you’d think they might want a conversation. There facebook page seems to have a similar problem. Maybe they need to hire an IT guy. I’m sure Coppage would be happy to help them out. (Even if his blog seems to have similar problems with disappearing posts. Ha! I’m sure we’ll be seeing a few of them heading our way soon. And they’re always welcome to comment. You’re right that they don’t extend us the same courtesy in their spaces. Of course the Discovery Institute would be upset about that – they’re a prime example of a disreputable institution with participants of dubious credential. If they were not, they would be able to get their “research” published outside of their own journals. When Intelligent Design shows up in Nature then it might be worth a look. Well done. You have more patience than I do for these faux scientists! Yes!!! Wonder why he didn’t reference this paper? ps, I edited the post to include your reference. Thanks for that! You seem skeptical that there are patterns in the genetic code, yet Stephen Freeland showed that the structure of the code is not an accident: “the canonical code is at or very close to a global optimum for error minimization”. http://www.mbe.oxfordjournals.org/content/17/4/511.long This means the code evolved to have these particular redundancies and uses of similar codons to code for amino acids as this arrangement is the most robust to mutation and error. ID researchers may be misguidedly and inexpertly attempting to reinvent this wheel, not realising that the underlying patterns already have an evolutionary explanation. I’m skeptical that re-arranging the amino acid table to make it prettier can give us new insights into principles underlying the code’s design. Of course there are patterns, but they reflect evolutionary history, as you say. I’m emphatically not in disagreement with that. I referenced the Stryer chapter for that very reason. Your paper is also a great reference. Thank you for that. I’ve edited the post to include it. My problem with the author of this paper is that he made absolutely no reference to any papers at all to back his assertions that such patterns exist, nor did he do any experiments to test his own statements. As you say ‘attempting to reinvent this wheel’. I have to say, as both a practising Christian and a scientist, that I don’t understand ID. Science starts from the assumption that the universe is regular, testable, naturalistic. What is the point of starting from that and then trying to force an untestable, super-natural conclusion? In my experience the vast majority of scientists who are also religious are content to think in naturalist terms while working in science, while acknowledging that there are mysteries beyond the reach of their labs and finding value in a religious approach to some of them. It may sound a little convoluted, but I think most people would identify with using different modes of thinking and feeling in different areas of their lives. I am disappointed that groups like the Discovery Institute pursue a program that is both doomed to failure and needlessly furthers a narrative that science and religion are inherently in conflict. As a christian and not a scientist, i fail to understand why scientists try to answer questions related to the origin of life/the universe. What is the guarantee that a naturalistic assumption is correct for these subjects.What is testable/regular about the origin of life/the universe. Aren’t scientists guilty of intellectual fraud when they make “Scientific” statements regarding un-testable, never seen events like the origin of life/the universe. Its really ridiculous that scientists comment on events beyond the reach of science with such Authority. How do you know something is beyond the reach of science until you try science? Naturalism is presupposed by evolutionists. Yet such a presupposition cannot itself be proven from within the system. Therefore, one cannot invalidate other presuppositions (i.e. supernaturalism) but appealing to the naturalistic presupposition. In effect, you have marked off a “grid iron” for play within the universe and compel everyone to play within your boundaries, and then taunt them that they cannot, within the bounds of naturalism, prove supernaturalism to you in a way that you would even consider. There is no explanation as to how life came from inanimate matter, let alone how everything came from nothing. Scientists take it “on faith” that someday they will be able to explain it, while mocking anyone who proposes another theory on faith. Science, or more precisely, mankind’s reason applied to observable, repeatable hypotheses is utterly inadequate for questions of origins of life and of the substance of the universe itself. Two words you need to look up the definitions for: abiogenesis and evolution. They are different. Suppose … I seriously make such an assertion to you. Surely you’d want to check it out, see for yourself. There have been innumerable stories of dragons over the centuries, but no real evidence. What an opportunity! The reason why scientist ask questions, because knowledge in and of itself has value. Penicillin was discovered by a scientist, who was rather sloppy, but stopped to ponder “hey, this is odd.” Cell phones are a result of black hole research. – Do you think these two examples are worthless? Humans who ask questions change the world. How do you account for your reasoning, if we are merely fortunate accidents, evolved electro-chemical piles of mud? What gives your worldview the foundation for trusting the very reason you try to use to establish it? And don’t even get me started about how a naturally occurring, fortunate accident can ever talk of right or wrong. If naturalistic evolution is true, then I claim right because I can beat you and kill you. Jennifer, thank you for this response to the charlatan Luskin. Kris, it was my pleasure. This is a great dissection and I would say more than worry about the affiliation of a scientific paper, one has to worry about someone who hasn’t done this type of dissection. I agree that, the lack of references in an introduction is the most worrying aspect. One has to address contrary research from past literature, and then hopefully refute it experimentally in the analysis. If this is cannot be done, then you don’t have an argument yet and you shouldn’t be trying to write a paper. ID seems to rest on the premise that all previous research on evolution is just opinion or something and doesn’t actually need by challenged scientifically. I guess the philosophy isn’t surprise considering they actually believe they are being scientific in their approach to ID. Good dissection of an IDC ‘research’ paper. Thank you, and thanks for the reference! ” If this is cannot be done, then you don’t have an argument yet and you shouldn’t be trying to write a paper. ” My sentiments exactly! Kudos……. Pro Tip: Don’t describe DNA as a “code” becaus ethe IDiots will say “A code is a message, ergo goddunit.” These are all just a huge set of chemical reactions that have reproductive power. The “code” we see is our shorthand for describing it, nothing else. I understand your concerns, Anonymous. However, they’re going to claim to find design no matter what I say, and in this case “code” is such a convenient shorthand that I decided to go ahead and use the word. But your point is quite valid. Dear Jennifer, I just noticed your post; I really liked the Genetic Code’s UK video that you linked; however, regarding my 2012’s BIO-Complexity publication, I decided to write to let readers know that in Fig. 7 that you are linking, my personal work only corresponds to the left side, or A, while right side, or B, corresponds to Fujimoto’s patent; on the other hand, your concerns with my article were addressed in my earlier publications. My article that you are discussing is a link in the chain of my most recent works. I understand that a researcher, to keep the feet on the ground needs a ‘Leslie Winkle’ from time to time, so send my greetings to Rudolf A. Raff and to the martial-arts instructor that helped you with this post. Sincerely, Fernando Castro-Chavez. It seems to me that the proponents of Science and the proponents of the ‘supernatural’ attempt to exclude each other. Although probably not an original thought, I am open to the concept that the ‘supernatural’ (magic, esp, withcraft, etc. etc.) can exist and rituals within ‘supernatural’ (rituals which work) may have been chanced upon and noted down and may take advantage of laws of science in branches of science which have yet to be discovered. e.g. subatomic physics is still being explored and is it possible that certain macroscopic actions may have predictable and repeatable subatomic effects? Can these effects then have a reflected macroscopic effect? Think of the ‘imaginary’ number field. Although this field is a very real branch of mathematics and has very real and observable uses the unfortunate name presents some difficulties to the unenlightened (and many students when first introduced to it!). Perhaps if we were to think of ‘magic’ as simply an undiscovered branch of physics. Having just now gone back and read ALL of the above replies I see that Eric Mills has put forward a similar concept albeit more concisely. The more scientists who are comfortable with religion and the more religious scientists we get the more likely we are to discovering this hypothesised branch of ‘magical science’ if I may be so bold. It was great to see your analysis – skilfully articulating what I could only describe as a general feeling of unease and confusion at that paper. I definitely need more practice using your advice on reading papers! I tried it on some that were closer to my own field and that had more meaningful content, and it was certainly a lot easier. Hopefully I can gradually progress to expressing more articulate critiques of papers that are not as good too. I’m reminded of an article I saw once in a magazine (New Scientist, I think), that followed a similar pattern – “look at all these symmetries in these group-theoretical constructs, look how we can arrange them, ooh isn’t it pretty” – but it was a world away in that there were gaps in the structures and they predicted new subatomic particles, whereas this guy Castro-Chavez makes no discernible predictions at all. Don’t mind me, I’m just musing to myself now! Just wanted to say thanks for all your help! Let me put it clearer this time: Jennifer Raff (the main author), and Rudy Raff and Steve Scott (who commented “on drafts of this”, according to Jennifer), did such a superficial survey of my article that they did not even notice that the image included by them in their successive “drafts”, was only a comparison between my work and the educational patent by Fujimoto (right side of Figure 7, see here above). Based on that, Jennifer, Rudy and Steve are either wrongfully attributing Fujimoto’s work to me (by lacking attention to detail), or else they are equally criticizing Fujimoto’s design and patent (thus ignoring the power of modeling in science). I have noticed before that such careless superficiality is evident in works based on the rhetoric sponsored by the Darwinian evolution; so, I wish to ask: Dear reader, do you want to persist in such superficiality as these three reviewers during your whole life? Thank God not everybody in the Scientific community is as biased as these three criticizers; otherwise, I could not have continued publishing my related and continued research on the subject, which I’ve successfully done, again, thanks to God! Hi FDOCC, thanks for commenting. My inclusion of your figure 7 is labeled exactly as you labeled it, including the reference to Fujimoto. I am not wrongfully attributing Fujimoto’s work to you, don’t worry. (And Steve and Rudy merely read my post to look for grammatical errors, they weren’t involved in writing it). Is there a different figure that you would prefer I use to illustrate my critique? Do you have any responses to my other points? I read it. Still waiting for any science to occur. Fernando Castro-Chavez, since you apparently place much importance on “the power of modeling in science”, I’m wondering if you would please show your scientific model for your chosen, so-called ‘God’ and for all the other so-called ‘Gods’ that have ever been imagined, believed in, and promoted? I’d like to see your scientific models for every particular so-called ‘God’, or at least a few hundred of them, so that I can examine and compare your scientific models and the so-called ‘Gods’ they represent. Jennifer, my comment didn’t show up the first time I tried to post it so I’m trying again. If it shows up twice please delete one of them. I apologize–first time commenters are automatically sent to the moderation queue by WordPress, and I sometimes can’t get to them immediately to approve them. You should be good to comment freely now. I wonder (well, sort of) why Fernando Castro-Chavez hasn’t responded to the points you made about his paper. I would think that he would want to discuss and defend the particulars of his paper, and especially the flaws that you pointed out. It seems to me that anyone who is confident of their claims would not fear open and honest discussion/debate. And speaking of open and honest discussion (or lack thereof) and confidence in claims (or lack thereof), I notice that Casey Luskin has not responded here to your critique. What a surprise! Not! He has a lot to say (actually, preach) from inside the ‘no comments allowed’ sanctuary of ENV but he won’t face his opponents out in the open. He and the others at the DI obviously like to see themselves as know-it-all ‘authorities’ who are above being questioned and challenged but to me it’s obvious that they are just afraid to openly discuss/debate what they claim because they know that their claims won’t pass scientific scrutiny. Dear Jenniffer, Thanks for your clarification! If you could put instead my figure six to prevent further confusions, that’ll be great! : http://www.ncbi.nlm.nih.gov/pmc/articles/PMC3445437/figure/F6/ Then, the point that I was making is that if everybody were thinking like you, my work will be banned and then you will be responsible for starting a contemporary “inquisition” against research and development, which thank God is not the case at all! I think everybody is entitled to his/her opinion, don’t you think? For example, after your ‘critique’ (well, any publicity is still publicity, so thank you very much! ); these are some of my later publications: 1) File Compression and Expansion of the Genetic Code by the use of the Yin/Yang Directions to find its Sphered Cube. Castro-Chavez F, J Biodivers Bioprospect Dev. 2014 Jul;1(1): 112; 2) Effect of lyso-phosphatidylcholine and Schnurri-3 on osteogenic transdifferentiation of vascular smooth muscle cells to calcifying vascular cells in 3D culture. Castro-Chavez F, Vickers KC, Lee JS, Tung CH, Morrisett JD. Biochim Biophys Acta. 2013 Jun;1830(6):3828-34. 3) Defragged Binary I Ching Genetic Code Chromosomes Compared to Nirenberg’s and Transformed into Rotating 2D Circles and Squares and into a 3D 100% Symmetrical Tetrahedron Coupled to a Functional One to Discern Start From Non-Start Methionines through a Stella Octangula. Castro-Chavez F. J Proteome Sci Comput Biol. 2012;2012(1): 3. After this one, I have no further comments here! [I mean, I need to keep myself busy researching!] To Mr. Zantho (please use your real ID as I do) I’ll say that, thank God we have not all the answers and that’s the excitement of why we continue studying, which in my case is to research with a purpose! As you yourself know, to be in a state of wonder! So, see you at work and God bless you! In Christ, Fernando.